I got this pattern in its original Alice Brooks envelope, ordered from the Hartford Courant, with a postmark date of 1961. It makes a doll toaster cover with the doll's head, torso and arms on a cardboard base that sits on the toaster, which is covered by her skirt. The doll part of the pattern is a transfer; the pattern for her outfit is meant to be cut out and used as a tissue paper pattern. She has a very exotic-looking face with features that may be embroidered, painted or drawn with crayons(?). She will be about 7" from her waist to the top of her head. The instructions call for "straw yarn" for her hair. She is made with separated pancake construction and has mitten hands. This pattern, with the same illustration, was also sold as #7073. I'm not sure if the pattern pieces are different at all; but the instructions are a little more detailed and the pattern is called a "Multi-Stamp Transfer Pattern." 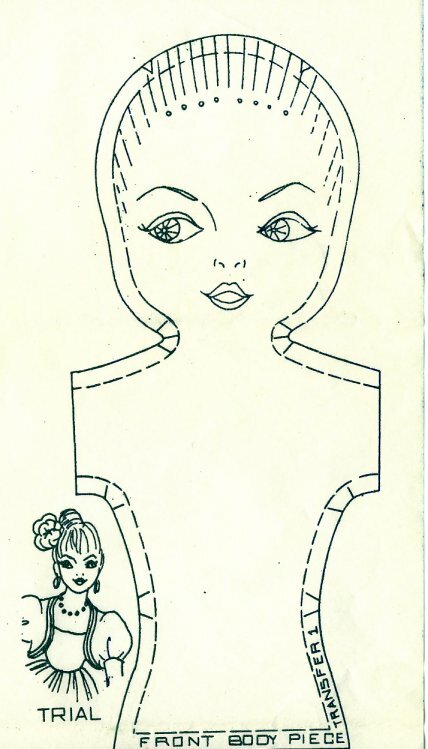 I was amazed in researching this pattern to see how many different doll toaster cover patterns were produced. It must have been a fad at one time.